Whether you’re a vinyl collector or simply a musichead, head to Zee’s Coffeeshop on Sundays to enjoy a musical evening with their vinyl sessions, featuring some of city’s best musicians. Does the slow spin and the crackling sound of vinyls and discs still enchant you as it did years back when they were readily available? Then, you’ll love this! Did you know Kolkata was home to one of Asia’s oldest record studios (owned once by HMV) that once manufactured vinyls for the whole country? Yep, our love for vinyls go way long back. 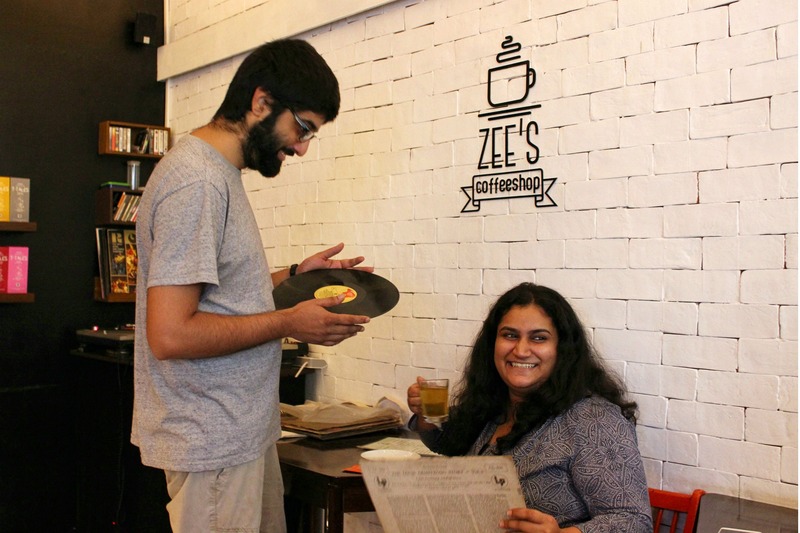 But if the rock, jazz and hip hop of the 70s, 80s and 90s still enrapture you just as much as the mellow sound of vinyls, then head over to Zee’s as Zareen (also, affectionately called ‘Zee’) and her music producer and DJ husband Varun Desai sets you up for a musical evening on Sundays. With two rare Technic 1200 turntables in the house and several rare vinyl records to Varun’s collection, drop by on Sundays to catch popular city musicians like Reevu Wangdi, Saptarshi ‘Sammy’ Bhattacharya, Josh Mukherjee and others bring in their music of rock, funk, jazz and hip hop and spin the vinyls. Interestingly, if you’ve got a few (or may be more) vinyls, you can bring them along with a needle and can be a part of the session, too. Kolkata’s vinyl culture may have declined, but with 2017 witnessing a record resurgence of vinyls globally, it’s time to revive ours. Starting 3 pm onwards, these vinyl sessions at Zee’s will keep happening on most weekends (unless otherwise the guys get caught up with their gigs elsewhere!). Musichead Ladies, Thank Wild City & Head To Zee's For Free CDJ Music Sessions!